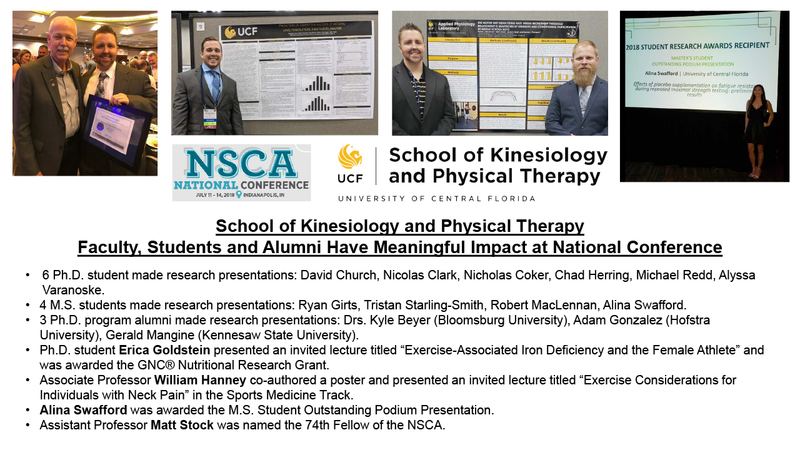 The School of Kinesiology and Physical Therapy had a strong showing at the National Strength and Conditioning Association’s 2018 conference, held July 11-14 in Indianapolis. Learn more. A UCF GoBabyGo! team retrofitted toy cars Saturday, March 3, for three children with limited mobility. The team included UCF physical therapy students and two visiting speech-language pathology students from Belgium, where a GoBabyGo! initiative is now under way. See pictures here. Two College of Health and Public Affairs students are among the 22 students selected for the Order of Pegasus Class of 2018. Nicholas Larkins is a health sciences student in the pre-clinical track and Maria Pennella is also a health sciences student. Read more about the Order of Pegasus Class of 2018 award here. The health sciences major is now the top major in enrollment at UCF and is second in academic degrees conferred. View a list of UCF’s top 10 majors at ucf.edu. UCF football player Tre Neal (#23) made the history-making game winning play on the goal line in overtime during UCF’s AAC Championship game Dec. 2 against Memphis. Neal is a junior majoring in health sciences in the College of Health and Public Affairs. View the winning-moment here. The Health Sciences Program will host four panel discussions on careers in health during the month of October. The panel discussions are open to any student interested in learning more about future health-related careers. Discussions can be viewed on Facebook live as well. Read more information about the panel discussions, including dates, times and locations, here. Doctoral of Physical Therapy Students Participate in UCF Go Baby Go! Four students from the UCF Doctor of Physical Therapy Program joined a team of 29 student and faculty volunteers from the UCF College of Medicine and the University of Florida College of Pharmacy for a week-long trip to provide medical services to Yantaló, a rural and underserved district in Peru. Adjunct faculty member Chris Doerger participated in the interprofessional health team trip, which took place from July 29 to August 4. Read the full story here. Three faculty members will be recognized Oct. 18 with the inaugural UCF Luminary award, designed to shine a light on exceptional faculty whose work is advancing their discipline and making a difference. This year’s recipients are Naim Kapucu, professor and director of the School of Public Administration; Jennifer Kent-Walsh, professor in the Department of Communication Sciences and Disorder; and Jennifer Tucker, lecturer in the Doctor of Physical Therapy Program.